Showing results for tags 'ugc'. UGC Overwatch Team In 2016 we created the first UGC Team for ADK. Moral was high, although our team play at the time was not. We were not able to successfully finish out the season. At the time, we had never properly won a game, and it was incredibly discouraging. Several members left, while others were eventually replaced. We held signups in January of 2017 to rebuild the team from the ground up. The Overwatch staff section put together what we thought would be the best team we could come up with. Over the last six weeks we have played games every Thursday in order to progress not only our own skill, but also our skill as a whole. We've had both wins and losses, but in the end we came out positive. This season so far we have been able to secure a winrate much higher than last season, and we are incredibly proud of that. Playoffs I am happy to announce that the Season 3 ADK UGC Team is going to playoffs! We are in the top 16 teams within the NA Steel bracket. The playoffs will consist of a double elimination bracket. If all goes as planned, playoffs will continue until early April. We hope to make ADK proud and do well in our bracket. However, all of us are excited to even be part of playoffs! Thank you for all the continued support for the Overwatch section as well as our UGC team. Please continue to wish us well throughout the next few weeks. Click HERE to view the playoff bracket. To view our bracket, click on the NA Steel Title Bracket tab. Future Once this season concludes, we will be opening up signups for next seasons team. Expect signups to begin in early April. This will be advertised throughout ADK, and I will also be posting another article to spread the word! Although we do not plan on entirely redoing our team, we will be accepting new players at during that time. We hope to continue to run the team in a similar fashion in the future. 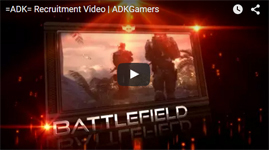 We'd also like the ADK team to participate in more tournaments and events in the future! Thank you for your patience in this selection period! The Overwatch staff has gone over all of the signups and has composed what we think will be the best team. If you were not selected, please do not get discouraged. Things are subject to change throughout the season, and we will most certainly be holding signups again for next season. As well as those who did not get the chance to apply in time, we may consider you throughout the season. Now, onto the fun part. UGC Competitive Season 3 Roster Tanks @Ian Main Tank DPS @Arveaus Main DPS @Ricky10games Main DPS Support @Liz Main Support @eXStoerm Main Support Congratulations! Congratulations to the 9 Selected members for our official team. In order to get things going, we will be having a meeting this Saturday at 8 PM EST. All members will also be receiving a group PM on the ADK forums on how to "officially" join the team roster on the UGC website.